Do you like The Big Lebowski? How about Shakespeare? And Tuscaloosa’s Downtown Pub? 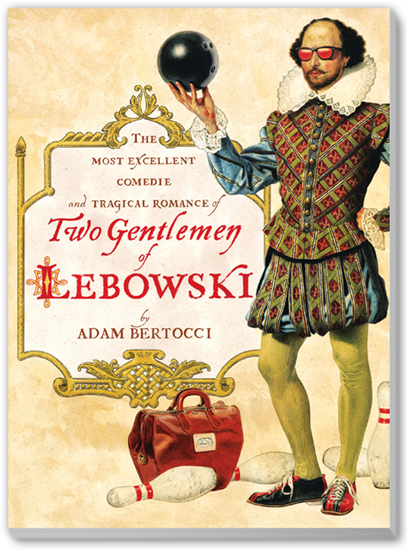 Join us on Monday, December 6th at 9:00pm at the Downtown Pub to read Adam Bertocci’s Two Gentlemen of Lebowski, a Shakespearean adaptation of the Coen Brothers’ The Big Lebowski. Expect swirlies, bowling, and lots of ‘abiding’ in true Elizabethan style. I should note that this is not a performance: the Coen Brothers reserve the adaptation rights to The Big Lebowski, and they’re not granting the stage rights to anyone. This is a group reading of Bertocci’s play. Buy a copy from Amazon.com (here) and come to the Pub on the 6th. We’ll assign parts as we go and dive right into the exploits of Geoffrey ‘The Knave’ Lebowski.